You are currently browsing the tag archive for the ‘firecracker’ tag. The first classes went well over at Firecracker Press. The Digital Letterpress class was full plus one, the letterpress fundamentals class only has two students, and the one-day Letterpress Techniques had two people. The workshop went well, but it was a long day and I didn’t eat lunch so I was getting pretty loopy by 5 pm. The 2 students were very good at what they were doing after the initial demos. I’d do few things differently next time, such as limit the materials available, encourage interaction between students, and really push the experimentation aspect of the class. With only two students who weren’t interacting very much, the class felt, well, dry. 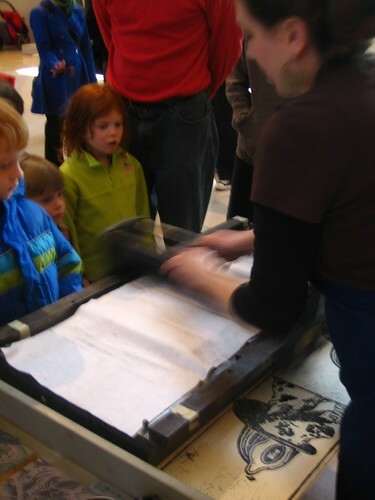 They came up with some good stuff, and one boy left with maybe 25 mono prints. The other gal produced a snarky greeting card with an text and image, and figured out registration pretty well too. All in all, it was a great day. I felt those two students took their money’s worth from the class for sure! Next week we’ll have another full Saturday with the Digital Letterpress in the morning, and then Letterpress Fundamentals in the afternoon. I am always impressed by what people produce in these classes. It’s very inspiring! Spring Classes at Firecracker Press! Firecracker Press is offering the following courses for Spring 2009 Just in Time For Valentine’s Day!! Instructor is Yours Truly of Lock and Key Press! (Except the woodcuts class, which I’m probably going to take.) Call (314) 776- 7271 to register! Letterpress Fundamentals is a comprehensive five week course focusing on the traditional methods of letterpress printing. 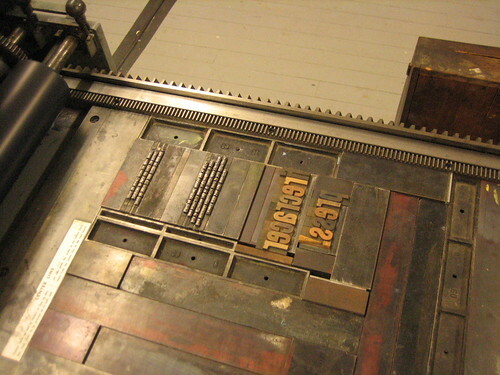 Students will learn the tradition of setting metal type, by hand, using our collection, make proofs and corrections, operate a Vandercook printing press and our antique platen press, mix ink by hand and learn the ins and out of paper. Each student will create an editioned piece of their design to exchange with all students, so everyone leaves the class with a small portfolio of fine prints! No prior experience needed. (Additional type deposit of $25.00 is required. Refunded barring no damage to equipment. Letterpress Techniques is a loosely structured class focusing on exploration of composition, inking, finishing and creative thinking with letterpress tools and equipment. 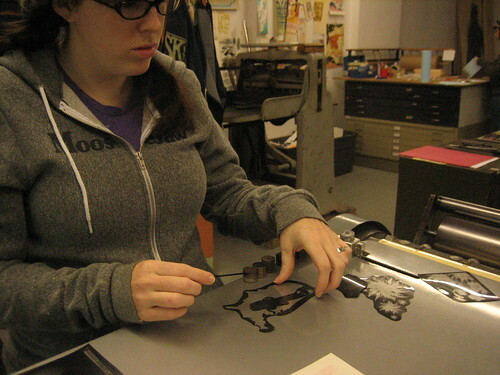 This class will consist of several demonstrations with lots of time for students to apply their own ideas and interpretations of the techniques learned while creating fine prints using wood type, metal type, and antique printing blocks. 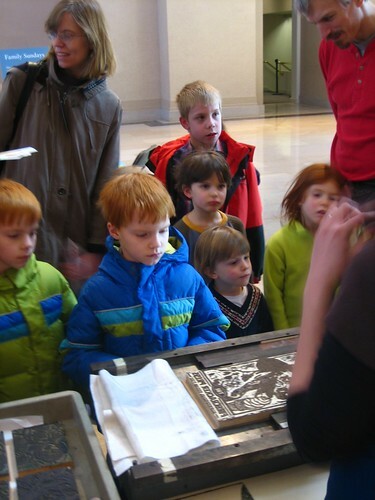 Students with their own woodcuts or linoleum blocks are encouraged to bring them to class. No prior experience needed. This class is a great precursor to Letterpress Fundamentals, and can be a fun addition to the Woodcut or Digital Letterpress classes. This course is a great way to combine old technologies and new ones. In this class students learn how to take their own computer based digital images and create photopolymer, relief plates that can be printed on our Vandercook printing press. Students will learn how to create a digital file, make a film negative of from the file, and then make a photopolymer plate using our platemaker. 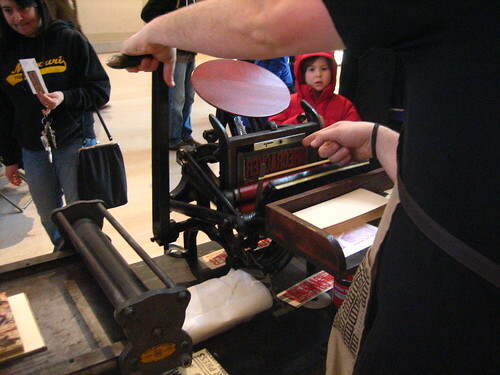 The Firecracker Press provides materials to get students started. The cost of specific project needs is up to each student and all additional materials can be purchased through The Firecracker Press. No previous experience necessary, but Letterpress Fundamentals or Letterpress Techniques is strongly suggested. Introduction to woodcut tools, materials, transfer methods, woodcutting techniques, inks and inking (brayers and press), paper, printing techniques. 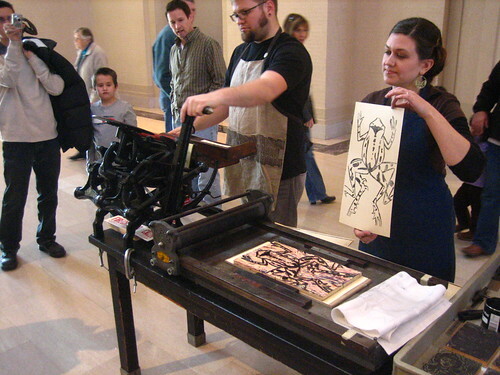 Students will dive into woodcut production using supplied materials and printing using supplied woodcuts, with self-guided projects to come. In addition to unique prints each student will create an editioned piece of their design to exchange with all students, so everyone leaves the class with a small portfolio of fine prints! 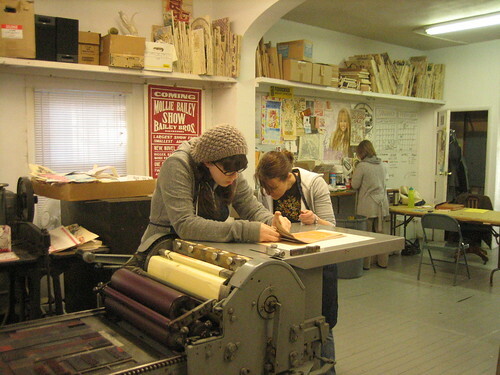 The Firecracker Press provides materials to get students started. The cost of specific project needs is up to each student and all additional materials can be purchased through The Firecracker Press.